Is It a Flavor? Is It a Color? It's Both! 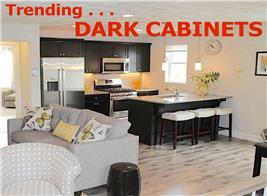 Spruce Up Your Home with It! Since its pumpkin spice latte was introduced in 2003, pumpkin-oriented products have sprouted everywhere. Pumpkin spice-flavored cereals, waffles, bread, pastries, ice cream, lip balm, candles, beverages, and hair dyes have saturated the market. In 2013 alone, according to Mediapost Communications, pumpkin-flavored items accounted for $308 million in food and beverage sales. And while there are a few quirky products (think hair dyes), experts believe that the pumpkin-spice trend is far from over. It has even gone into the area of home decor! The power of the pumpkin now extends beyond food and beauty products to home decorating ideas. From the front door to the fireplace mantel and accents in the living room, kitchen, bathroom, and bedroom, pumpkin orange and its muted "spice" hues are gracing homes across the country. If you’re not on the pumpkin train yet, come aboard and spice up your home with these pumpkin-inspired décor touches. 1. 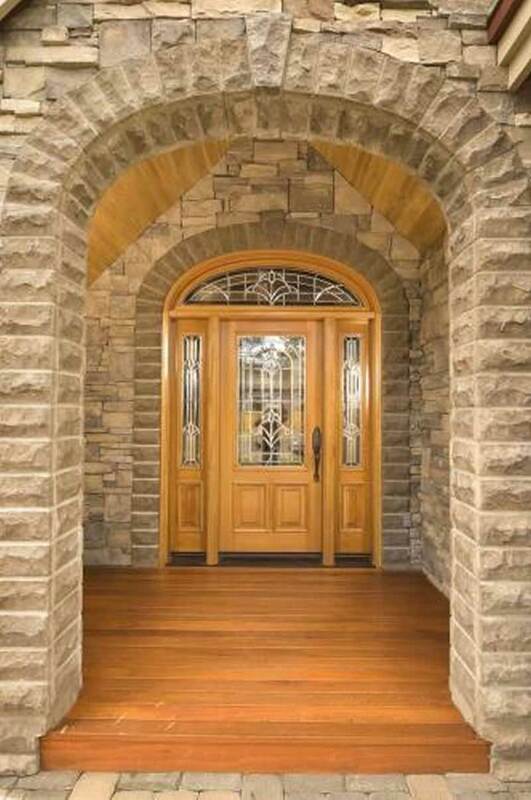 Start with the front door – While most people may consider orange too bright for the front door, a toned-down shade may do the trick and “cheer” up the space. A fall wreath is an excellent finishing touch for the front door. Color it pumpkin – as in the natural hues of the hardwood floor in the entryway and the front door of this 2-story, 4-bedroom French country-style home plan (House Plan #149-1158). 2. 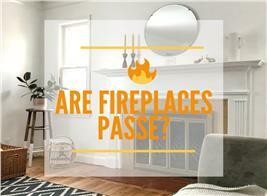 Highlight the walls and fireplace mantel with paint – One of the simplest ways to perk up a room is to paint the walls and a designated focal point – usually the fireplace mantel. 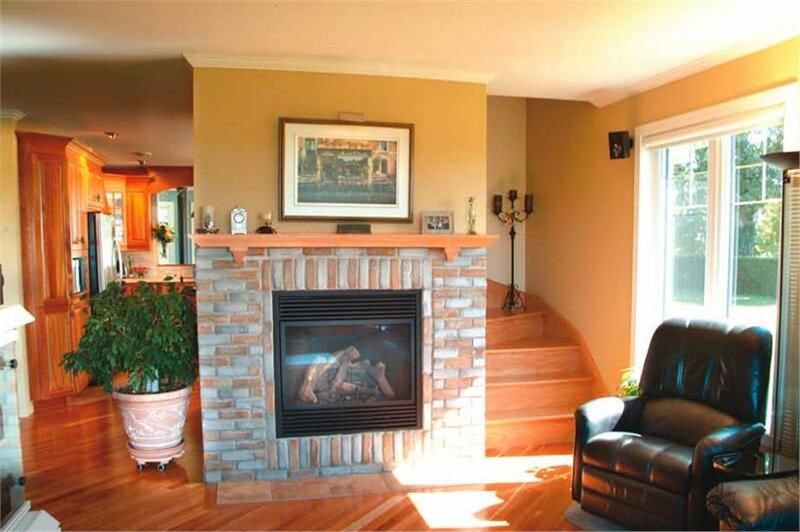 This brick fireplace with a light orange fireplace mantel is the focus of this living room in a 2-story, three bedroom Country-style home plan. 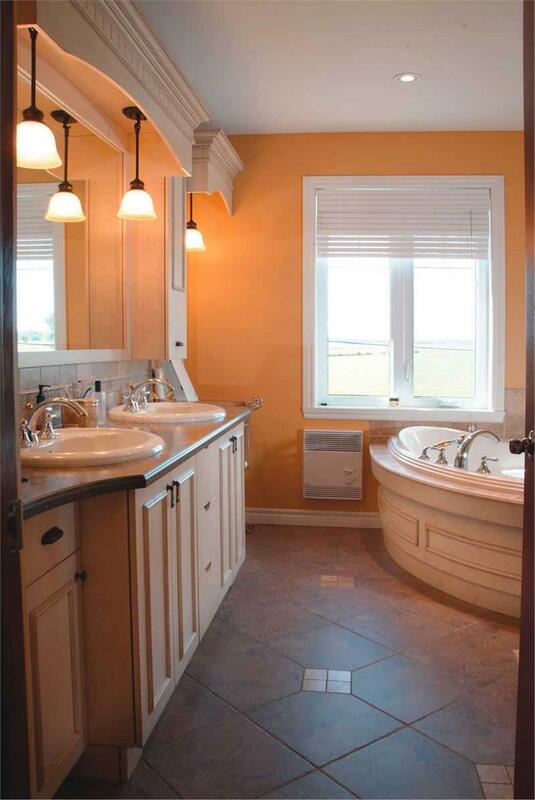 The pumpkin-painted walls complement the color scheme (House Plan #126-1031). 3. 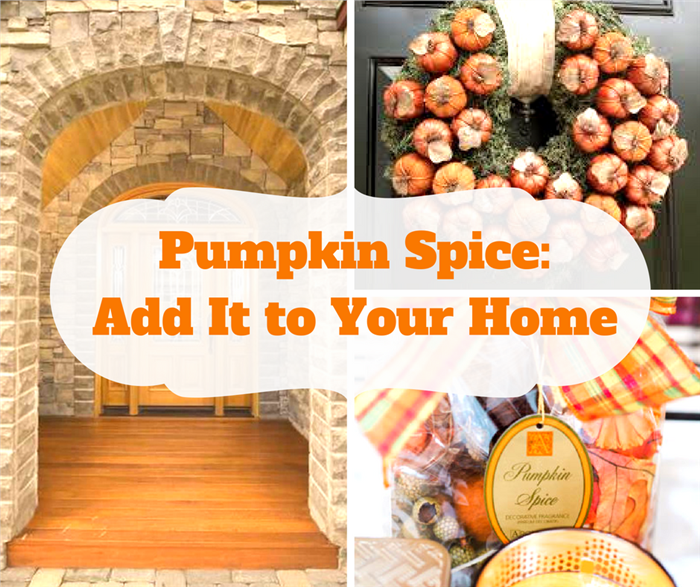 Use accents in the Great Room (living/dining/kitchen areas) – Keep the décor simple in an open floor plan, but still go with the pumpkin spice trend. Try vases and flower arrangements for coffee and end tables, and pillows and throws on the sofas. If your room is painted a neutral or subdued shade, just add orange, rust, or brick red accents. From its walls to the sofas, this living room is definitely into the fall and pumpkin theme – with the orange pillows on the sofas and chairs and pumpkins on the table. 4. Bring the pumpkin spice touch to the bathroom – In addition to painting the walls and adding accent décor, use pumpkin-spice-scented candles, potpourri, and bath salts to enjoy the pumpkin spice smells. A 2-story, 3-bedroom Country-style home plan features a bathroom with walls painted a light orange shade that keeps up with the pumpkin spice mania (House Plan #126-1031). 5. Add “spicy” warmth to the bedroom – Change the look of your bedroom by bringing in the colorful pop and sunshiny shades of pumpkins. Switch out summer quilts and bed covers with bright and fall-themed comforters and blankets. 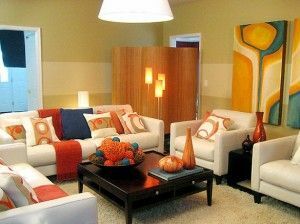 Décor accents can include orange wallpaper, pillows, throw rugs, and dried flower arrangements. Décor accents in orange (left) make this children’s suite even brighter. Check out the throw rug, the pillows on the bunk beds and sofa, and the tiny pumpkins on the basket/coffee table. You don’t have to go overboard with the pumpkin spice trend. Simple décor touches – orange wallpaper, pillow, and cover – make this bedroom at right very attractive. As we said previously, the pumpkin spice craze began – and continues full bore – in the food industry. Here are some pumpkin spice products that you may not have thought of as "pumpkin spice candidates," which you can store in your kitchen shelves and refrigerators. 1. Breakfast food – Cereal companies want a slice of the pumpkin pie, too (pun intended) … as they offer cereals, toaster tarts and pastries, and ceral-grain bars. Get ready for pumpkin spice-flavored muffins and bagels, too! 2. Snacks – It’s pumpkin spice makeover time for traditional snacks like cookies, marshmallows, candy and crackers. 3. Beverages –- Pumpkin connoisseurs will enjoy pumpkin spice-flavored spice coffee and tea (both hot and chilled), milk and of course beer. 4. Yogurt and ice cream – More surprises along the grocery aisles await the shopper – with the pumpkin spice trend moving to dairy products. 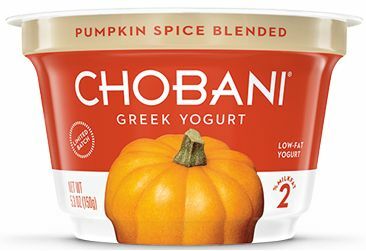 Today, companies like Chobani, Siggi’s, and Edy’s now offer the consumer low-fat pumpkin spice-flavored yogurt and ice cream. Are you adventurous enough to go for some pumpkin spice-flavored yogurt or ice cream? 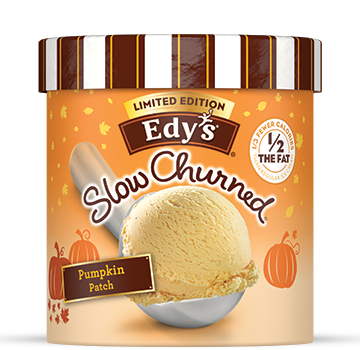 There are a few choices in your neighborhood grocer, like Chobani's pumpkin spice blended product (photo courtesy Chobani LLC) and Edy's slow churned pumpkin patch flavor (photo courtesy Nestlé USA). 5. Beauty Products – Always in the forefront of any trend, beauty product manufacturers have created a line of pumpkin-based moisturizers, masks, shower gels, peels, hand and body lotion, and lip balms. 6. Scented candles – Now you can add pumpkin spice to a line of candles and other products that are being launched to take advantage of the pumpkin spice trend. How much longer the pumpkin spice rage continues is anybody’s guess. 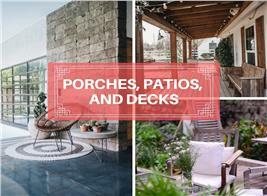 But while it’s around, be adventurous and open to pumpkin-spice-inspired food and décor. Share your favorites in the comments section below. Footnote: The lead image in this article features a fall wreath tailor-made for the front door (upper right, photo courtesy Brit + Co) and an attractive basket of pumpkin spice-scented potpourri and candles (lower right, photo courtesty Sara Sunstrom Photography/Quad City Moms Blog).